The middle of the nineteenth century saw the proliferation of genre paintings in response to the changing market demands of the time. 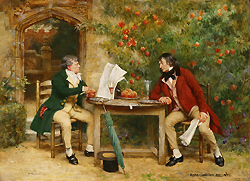 Artists in Britain and across Europe increasingly produced a large number of genre paintings that appealed to the taste of middle-class art buyers for “the depiction of every day life scenes on as intimate - and often as trivial - a level as possible,” and what “people were up to particularly behind closed doors” in “times or societies not familiar to the contemporary spectator.” (Philip Hook and Mark Pottimore, Popular 19th Century Painting: A Dictionary of European Genre Painters, Woodbridge, Suffolk: Antique Collectors' Club, 1986, pgs. 12, 13) Among this variety of genre paintings, those depicting intimate scenes set in the past became very popular. Such paintings came to be known as historic genre. They were sometimes based on literary or historical subjects or were imaginary reconstructions by the artist. In some cases, they portrayed domestic, sentimental and romantic scenes in the past, and at other times, the private moments of famous historical figures. Bennett was one of the artists who chose to look at the past for inspiration. Besides portraits, he painted everyday life scenes, hunting and tavern scenes set in the past, as well as other scenes that emphasized ordinary events in the lives of historical figures particularly those of Charles I (1600-1649) and Sir Francis Drake (1540-1596), and scenes of Cardinals in their private quarters, a very popular theme at the time. Moreover, Bennett designed, restored and made furniture, and had a large collection of historical costumes. During his lifetime, Bennett’s works appealed to the rich and poor alike, and he became best known for his Elizabethan subjects, many of which were reproduced as prints and were often used in advertising, calendars, blotters, jigsaw puzzles, greeting cards, and magazines. At some point in time, Bennett enrolled at Browns House, Clifton College in Bristol where he studied until 1892. He then decided that he wanted to become an artist and enrolled that year, in the Slade School of Art in London, where he met Eddie Wells who would become a close friend and later his brother-in-law. Together they studied under some well-known artists such as Henry Tonks (1862-1937), Philip Wilson Steer (1860-1942), and John Singer Sargent (1856-1925). In 1894, Bennett went to St. Johns Wood School of Art where he spent a few months, before joining the Royal Academy School of Art in 1896. While studying at the Academy, he won a gold medal and a travel scholarship in 1899 for his lithograph entitled Ladas the Greek runner falling dead as he goes to receive his crown of wild olives at Olympia. Around 1900, Bennett invited his friend Wells to join him on a painting expedition to Italy. As mentioned by Son, he financed the trip with the award that he received from the Royal Academy in the amount of two hundred and thirty pounds, and probably with additional funds from his father. (pg. 5) Bennett and Wells toured Italy for approximately a year, visiting Florence, Sienna, Brescia, Ravenna, Viterbo, Rome, Naples, Capri, Sorrento, and the Amalfi Coast. Upon his return from Italy, Bennett went to live with his parents in London, where they had recently moved from Liverpool. He continued to study, and at the time painted mostly portraits and some genre paintings. In the meantime, Bennett and Wells began courting the Pellew sisters who came from a wealthy family in Devonshire. In 1907, Bennett married Margaret Alma Pellew, and in 1910, Wells married her sister Anne Helen. The Bennetts would have 2 children: Barbara Francis and Edward Fleetwood Pellew. They lived mostly in London, first in Knightsbridge until 1911, then in Victoria where they had some distinguished neighbors such as the Sackville-West family and Lord Stanmore. In 1938, they decided to move from London to Devon where they spent the rest of their lives. They settled there in a 330 acre dairy and arable farm, called Whetcombe Barton, which was managed by their daughter Barbara and her friend John Hicks. Bennett painted a range of historic genre paintings that were set in the sixteenth, seventeenth and eighteenth centuries. His favorite subjects were tavern scenes, hunting scenes, everyday life, and Elizabethan and Stuart historical figures. Examples of this genre include The Landlords Story, one of his most famous paintings; Cavaliers Playing Cards (1934); Tea and Scandal (1938); There’s plenty of time win this game and thrash the Spaniard’s too, showing Sir Francis Drake playing bowls before going to fight the Armada (1944); Van Dyke at the court painting a picture of King Charles I children (1946); and Dr. Johnson at the Cheshire Cheese (1945). The latter painting is an eighteenth century scene showing Dr. Johnson, conversing with well known figures of the time, such as the portrait painter Sir Joshua Reynolds (1732-1792), the British statesman Edmund Burke (1729-1797), among others. 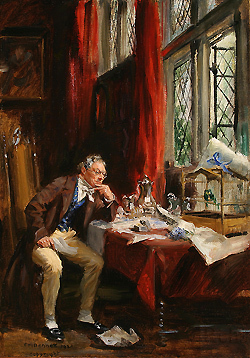 Bennett also painted a series of pictures showing Cardinals in their private quarters. Such paintings, which “constitute a clearly defined genre painting in their own right” were “comic and full of character,” and therefore continued to be in demand. (Hook and Pottimore, pg. 97) Late but Welcome (1931) may serve as an example. In this painting, seven Cardinals are seated around a dining table about to finish their meal, the head chair vacant, and as the Cardinal is being shown in the room they seem to be having a joke welcoming the late arrival. Some of Bennett’s other genre subjects included those of card players such as A Game Of Patience (1936), and Poker Players; and horse drawn carriages in the late eighteenth and early nineteenth, for example The London to Glasgow Coach (1944), and Temple Bar (1950). Bennett aspired to achieve historical accuracy in his paintings. He would use the furniture that he designed, restored and made in his pictures, and would dress his models in historical costumes, of which he had a very large collection (some are now in the Platt Hall Museum in Manchester, the Museum of London, and the Colonial Williamsburg Foundation in Virginia in the United States). His models were mostly his neighbors, friends, family members, and according to Son, Bennett had only one paid permanent artist model, a handsome young man called Frank Gregory, who appeared in many of his paintings. Otherwise, he hired other temporary models namely art students when he needed them. (Son, pgs. 8, 9) On his expeditions abroad and throughout Britain, he would make sketches in oil or in pencil of the exteriors and interiors of cottages, inns, castles, famous estates and country houses, and would later use them as the backdrop for his paintings in his studio. Bennett enjoyed public success during his lifetime. 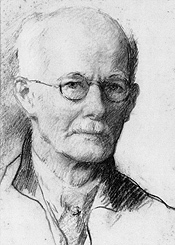 He exhibited his works in London at the Royal Academy from 1898 until 1928, Liverpool Art Gallery from 1899-1832; the Royal Institute of Watercolor Painters; Royal Institute of Oil Painters; Rembrandt Gallery, and at the Paris Salon in France. Furthermore, Bennett sold many of his works through a number of art dealers mostly in London. Among them were Henry de Casseres of Casseres of Warwick Street; Rayner MacConnal of Rayner MacConnal Antique and Works of Art Dealers in St. James; and N. Mitchell Fine Art Gallery. As Bennett’s works were popular, many of them were reproduced as prints and were often used commercially. Some examples of the commercial use of Bennett’s prints include: calendars published by Thomas Foreman and Sons; cigarette cards for Imperial Tobacco Company, advertising for Worthington Beers; cover for Country Life and Vogue magazines. Bennett continued to paint until the end of his life and “his passion for art never waned.” (Son, pg.17) He died at his home in Whetcombe on February 23, 1952 from a perforated duodenal ulcer.